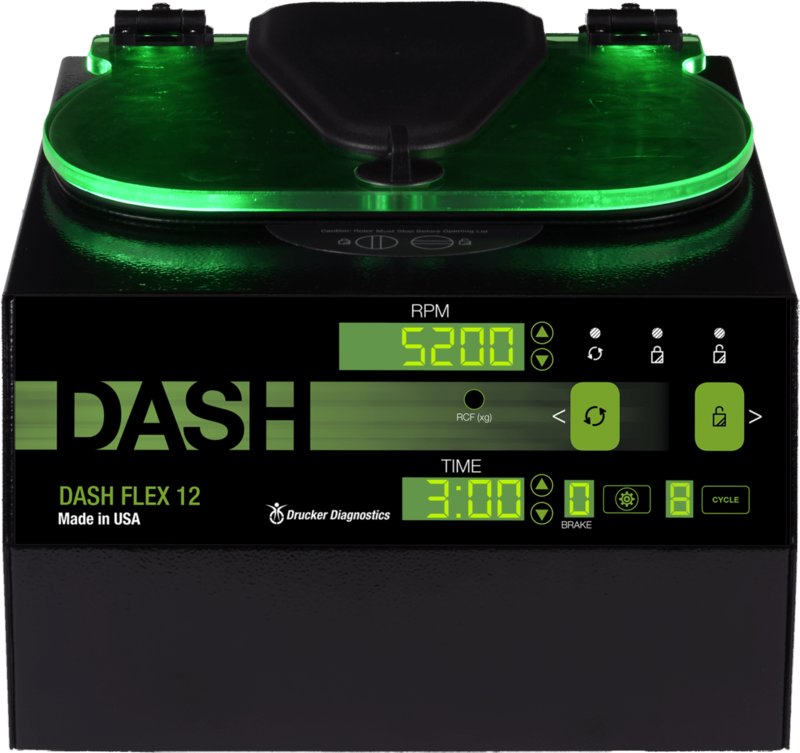 The DASH Flex 12 STAT centrifuge goes the extra mile to shorten turnaround time. Green lid lights are visible from across the lab and indicate when the unit is done (flashing), still running (on) or ready (off), reducing the chance that specimens are left waiting or forgotten. 10 cycles can be programmed in memory for acceleration, deceleration, speed, g-force, and runtime, and are shown on the digital display, along with the time remaining in the cycle. What is the warranty on Drucker’s centrifuges? Drucker Diagnostics provides a two (2) year parts and labor warranty (except the rotor – see question below). What is the warranty on the rotor? All rotors carry a lifetime warranty. Should the rotor ever fail, for as long as you own your centrifuge, Drucker Diagnostics will replace it free of charge. Will I need to purchase accessories for the centrifuge separately? All of our centrifuges are sold complete with the rotor and tube holders. No additional accessories are necessary though there are additional options available for purchase. How often should my centrifuge be calibrated? Drucker Diagnostics recommends the centrifuge be calibrated every 2 years or 5,000 cycles. How can I validate my centrifuge for use with different tubes (Vacuette, Monovette, etc.)? Drucker products Centrifugation Validation documents for STAT testing. They can be downloaded here. What should be used to clean and disinfect the Flex 12? ONLY isopropyl alcohol, soap and water, or a 10% (5,500 PPM) bleach solution should be used for cleaning and disinfection of the centrifuge and accessories. All surfaces must be dried immediately after cleaning and disinfecting. What cleaning solutions should be avoided? TBQ Germicidal products should not be used as they will cause damage to the centrifuge and void the warranty. The use of fully/partially halogenated hydrocarbons, ketones, esters, ethers, benzyls, ethyl benzenes, and all other chemicals not prescribed by Drucker Diagnostics should not be used as they may cause damage to the rotor chamber, rotor, tube holders, accessories, and centrifuge exterior. If this occurs the warranty will be voided.